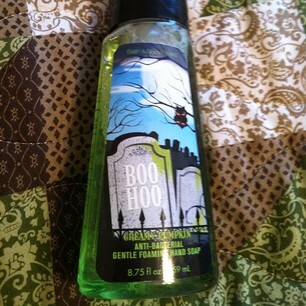 Candice Craves: Haulin: Bath and Body Works! 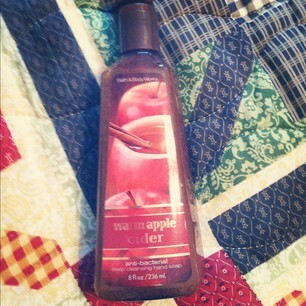 Fall is my absolute favorite time for Bath and Body Works!! Getting their soaps and candles are pretty much tradition for me this time of year. I pretty much only shop there 3 times a year. Fall, Christmas, and their Semi-Annual sale. They released their Fall / Halloween line to the stores last week so I had to go get some for the season. 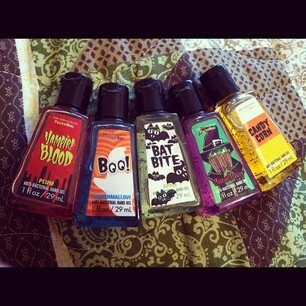 I love the $5 for $15 anti-bacterial soaps. I always keep one at my kitchen sink and two bathroom sinks. Fun tip::: The anti-bacterial soaps are highly concentrated. I always buy the original soap as opposed to the foam soap if it's available in the scent I want because it lasts a lot longer then the foam. When my soaps get down about half way, I always fill them back up with water and shake a little bit! They are full again and you don't lose anything. It makes them last so much longer!! Sweet cinnamon pumpkin is one of my all time favorites. The cinnamon is pretty strong so beware of that if you don't like cinnamon scents. How cute is the label on this bottle?!? I think this Warm Apple Cider is new this year! At least I don't remember it. It smells sooooo good. It has a very apple pie smell. Apples and vanilla plus a little bit of citrus. I can imagine almost everyone would love this scent. 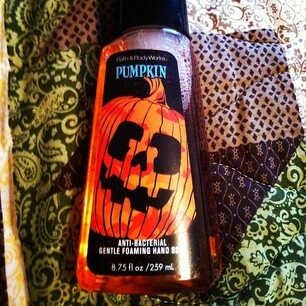 This pumpkin hand soap is exactly what is says. Pumpkin. It smells like a can of pumpkin. Nothing else. I like it plus the label on this one is just too cute. This BrewBerry soap is super cute. 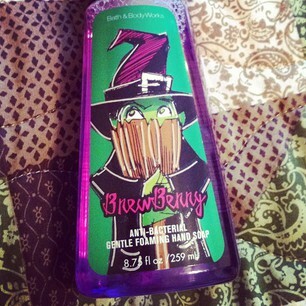 I love the green witch label and the soap is a pretty purple color. The scent is a simple clean berry scent. 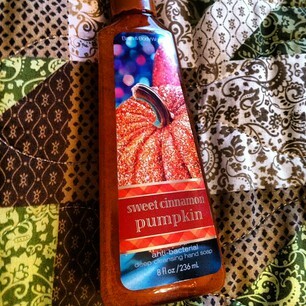 I like it to break up all the cinnamon and pumpkin scents that I have everywhere else. Pocket Baks are 5 for $5!! I keep one of these in my diaper bag and purse so we go thru them like crazy. Good think they're cheap. They had 8 or so halloween ones so I picked my 5 favorite. Vampire Blood is a plum scent. Boo is a marshmallow scent, Bat Bite is an apple scent. BrewBerry is berry scented. And candy corn smells like candy corn. As a fun little extra, some of the labels glow in the dark! I know Bat Bite does and I think Boo! does as well. 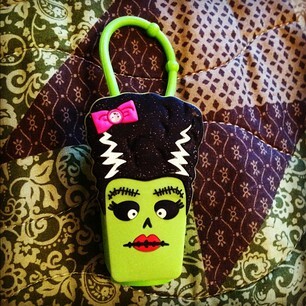 This was my favorite thing from their new Halloween line! How cute is she?!? She is a Pocket Bak holder. I just love how detailed they made her from her red lips to her pink diamond - studded bow. She will be hanging out on my diaper bag for the season. And that's my haul!! I really want to get some Fall candles but I'm going to wait until they're on sale. They also had their Wallflowers $6 but I'm not really a fan of those. What's your favorite Fall scent?!? Comment below I would love to know! In my view, if all site owners and bloggers made good content material as you probably did, the net will probably be a lot more helpful than ever before. I've been exploring for a little bit for any high quality articles or blog posts on this kind of house . Exploring in Yahoo I ultimately stumbled upon this site. Studying this info So i am happy to show that I've an incredibly just right uncanny feeling I came upon just what I needed. Hi, i believe that i noticed you visited my website thus i got here to go back the desire? .I'm attempting to in finding things to improve my website!I guess its good enough to make use of a few of your ideas! !